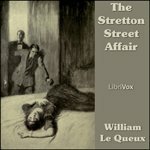 William Le Queux was a British novelist and prolific writer of mysteries. Indeed, mystery surrounds the author himself. About The Stretton Street Affair – Hugh Gabriel has recently been repatriated from the war and has rejoined his old firm as an electrical engineer. On the way to visit his uncle one night, he is asked by a servant if he would be willing to meet with his wealthy master who is in some distress. Hugh becomes witness to, and directly involved with, a dastardly murder. Or has he? Who is this mysterious millionaire Oswald De Gex he has been asked to meet with? Is Doctor Moroni an honest physician or a diabolical monster? And what about the fair Gabrielle – but then, is there more than one Gabrielle? Le Queux, the Master of Mystery once again weaves an intricate plot which takes Hugh Gabriel to locations throughout Europe as he tries to unravel a scheme that he does not understand, nor why he is involved. As with most Le Queux mysteries, you may have to listen to the final chapters to solve the enigma. Listen Now! Click on a chapter to start the audio.